Since we traveled around the Philippines on a budget, most of our meals consisted of street food and cheap (but hearty) dishes at local eateries. 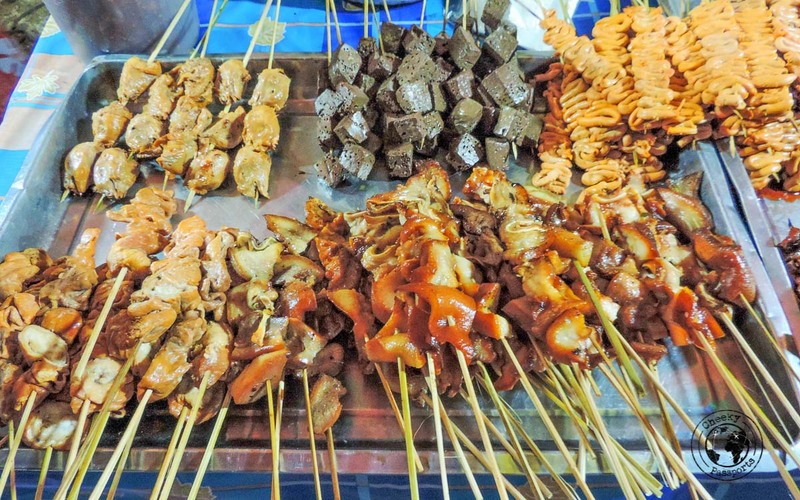 Street foods in the Philippines are often deep fried or grilled and very tasty, though definitely not the healthiest option around! 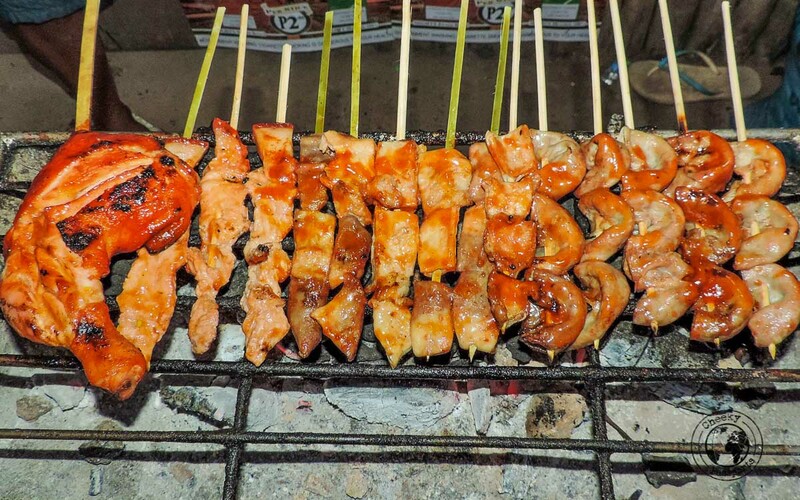 Healthy or not, here are 15 must try street foods in the Philippines . Soft and fluffy, the siopao is a steamed bun filled with a variety of pork, chicken or egg fillings. 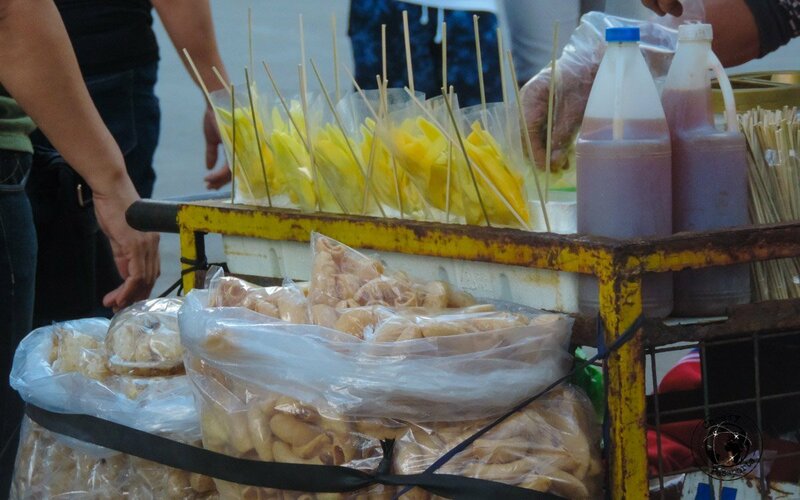 It is one of the most common street foods in the Philippines, being widely available from fast food stands & 7-11’s. 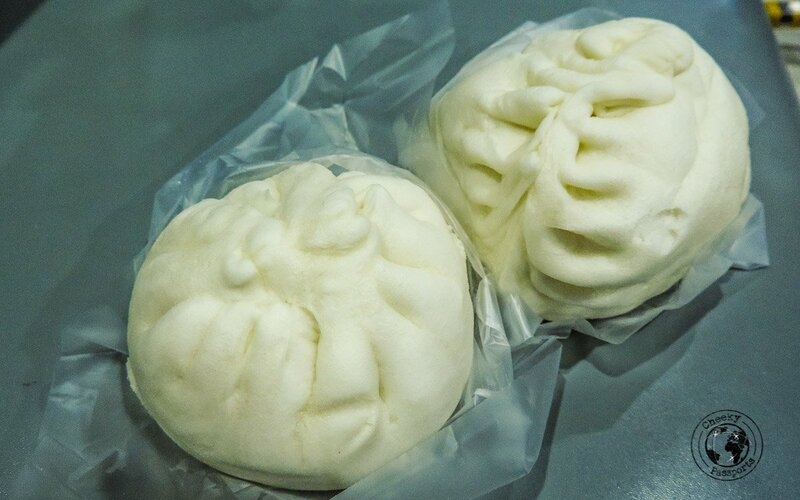 The siopao comes in various sizes and is very affordable – less than 50 PHP (<€1) a piece, making it an ideal lunch snack if you’re traveling on a budget. Our favourites were those filled with Chicken Asado and Bola-Bola (flavoured minced pork) fillings. 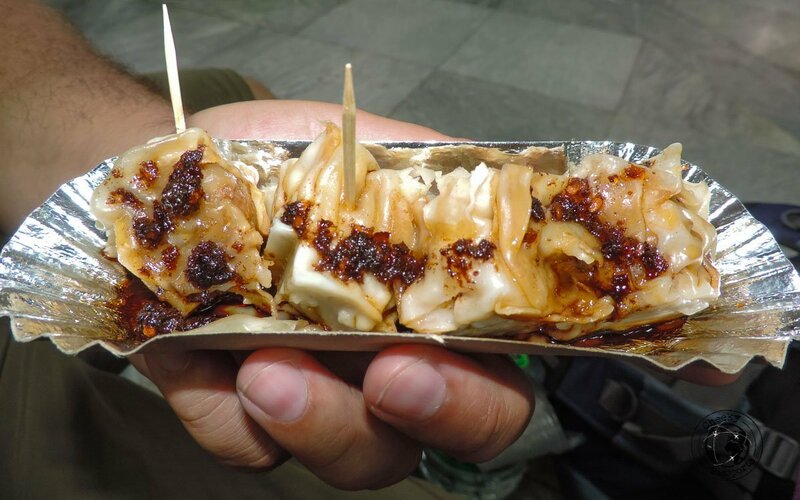 Originally from China, siomai are little steamed dumplings filled with minced meat and vegetables. They are served up on the street in little trays with a choice of different sauces. They are so tasty that one or two are never enough, we always consumed way more than we should have! 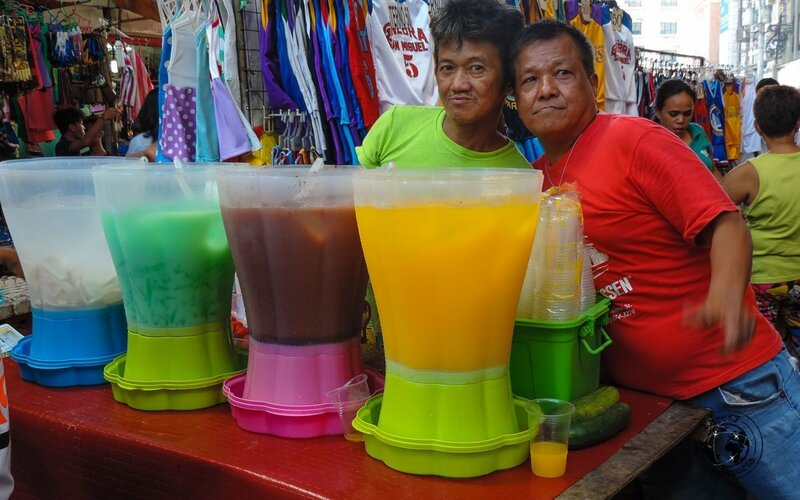 One of our favourite street foods in the Philippines! 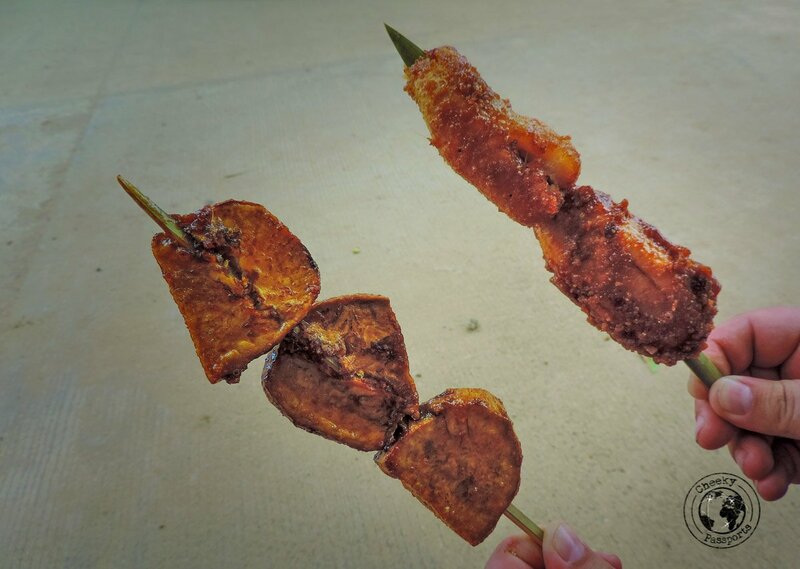 This is surely one of the most adventurous street foods in the Philippines, but be aware that it looks way worse than it actually tastes. 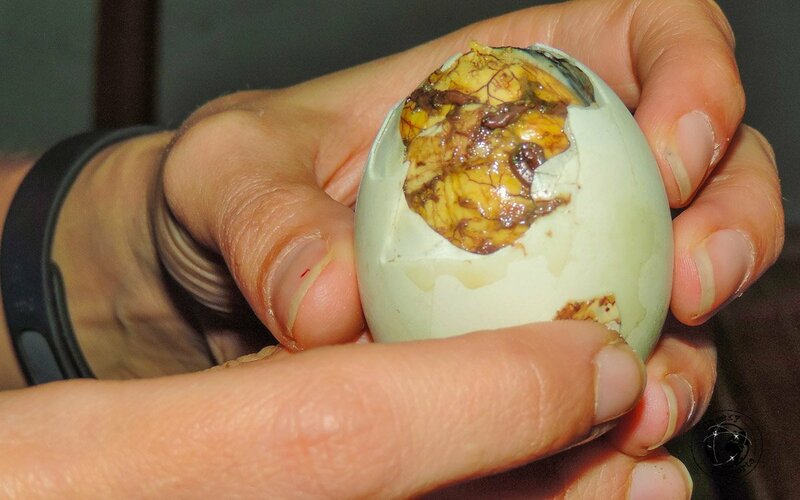 In case you’re not familiar with the Filipino street food delicacy, Balut is actually a boiled, fertilized duck egg which is eaten directly from the shell after you sip out the juices surrounding it. According to Michelle (who was the one to try it), the Balut tastes a lot like crunchy chicken soup! “Meats” could mean anything in the Philippines. Little barbeques serving kebabs of liver, intestines, testicles, chicken feet and any other part of an animal that can be grilled, are ubiquitous street foods in the Philippines. Sticks with chunks of coagulated blood are common too. Sometimes you will even find chicken legs or breast on a barbeque though! These little sticks of meats are inexpensive (10-20 PHP, €0.20, per stick), but do check that all the meat has been cooked right through. 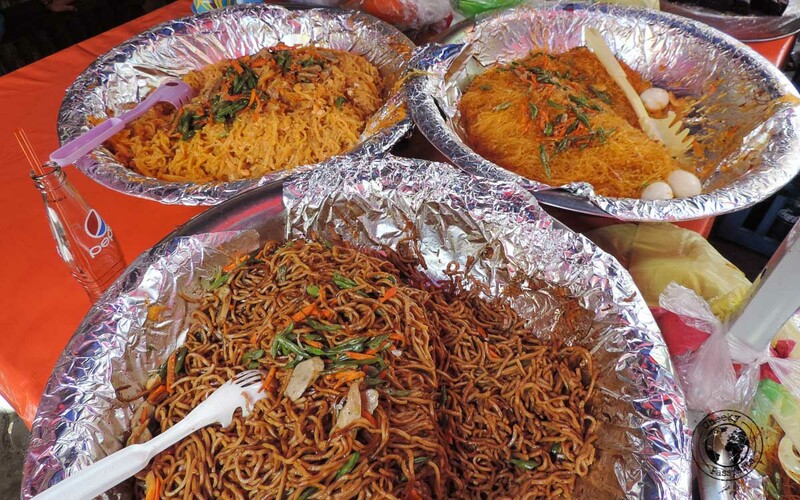 A variety of noodle dishes are available from many stalls, being a very common Filipino street food. Shrimp, chicken, vegetables, you choose! Inexpensive and filling – perfect for those traveling on a budget! This is a soup cooked with tamarind which typically gives the dish a strong and sour flavour. It was not our favourite item but seems to be a very popular Filipino street food! 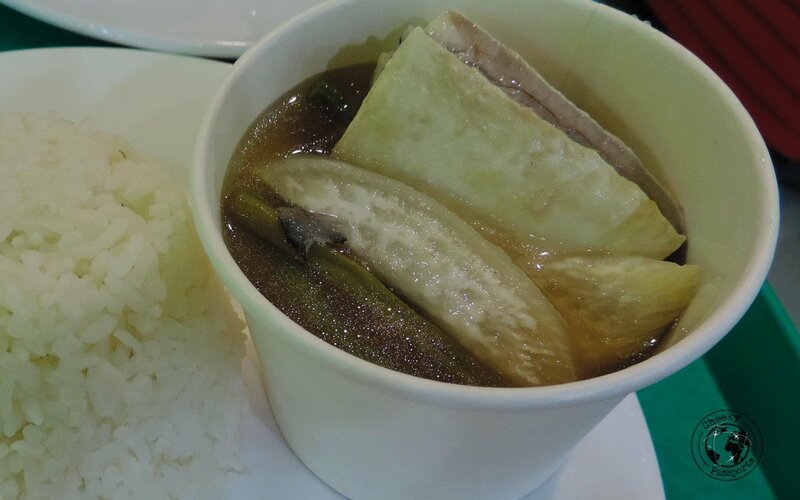 The soup shown in the picture is bangus (milkfish) sinigang which Michelle had for breakfast one day. Nikki’s pancit was a better breakfast idea. 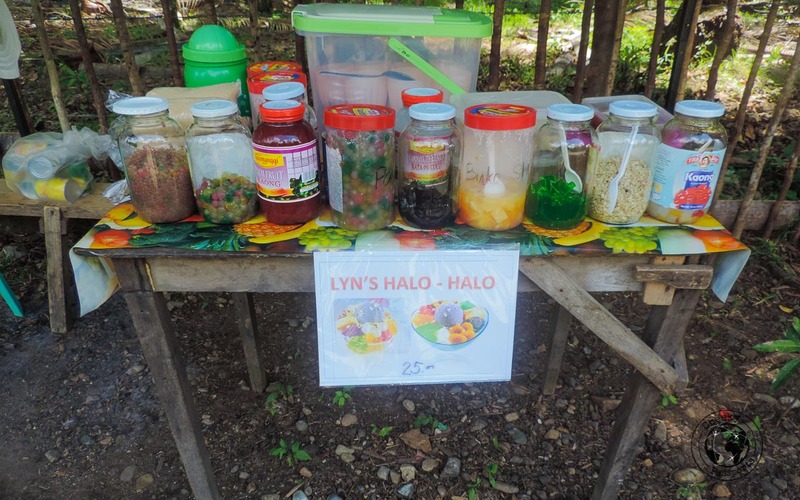 It is difficult to describe Halo-halo exactly since different vendors all seem to make their own version of it. The best we can come up with is crushed ice covered in sweet condensed milk to which several ingredients are added. The unlikely ingredients may be sweetcorn, beans, cooked pasta, coconut, jelly and fruits. Hal-halo is sometimes topped up with a ball of icecream and caramel sauce but the versions seems to depend a lot on what is available. Though it may sound like a rather weird concoction, we quickly became addicted to the dessert and often had skipped lunch in favour of one (or more) Halo-halo. 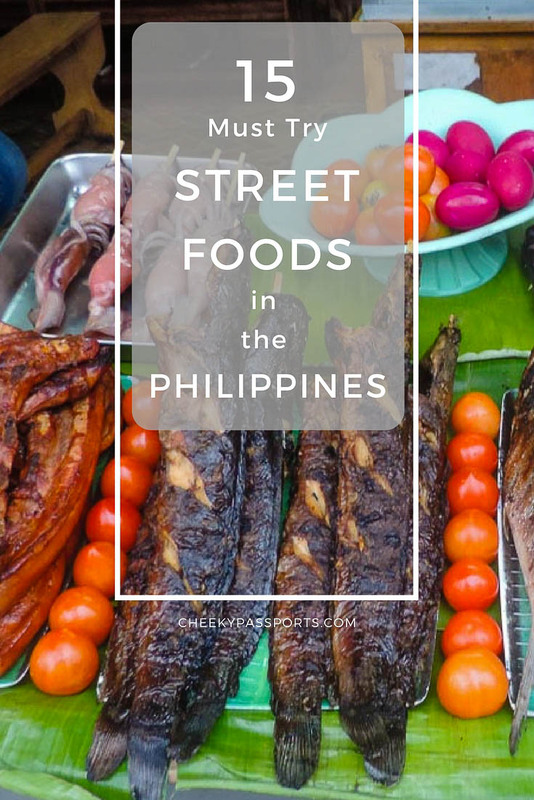 Definitely one of the street foods in the Philippines that you should try at least once! We first tasted mango with chilli in Baguio when we thought that we were just purchasing plain mango slices. The combination of spicy chilli and sweet mango surprised us so much that we just had to get some more! From then on, mango with chilli became a staple snack, one of our favourite street foods in the Philippines! 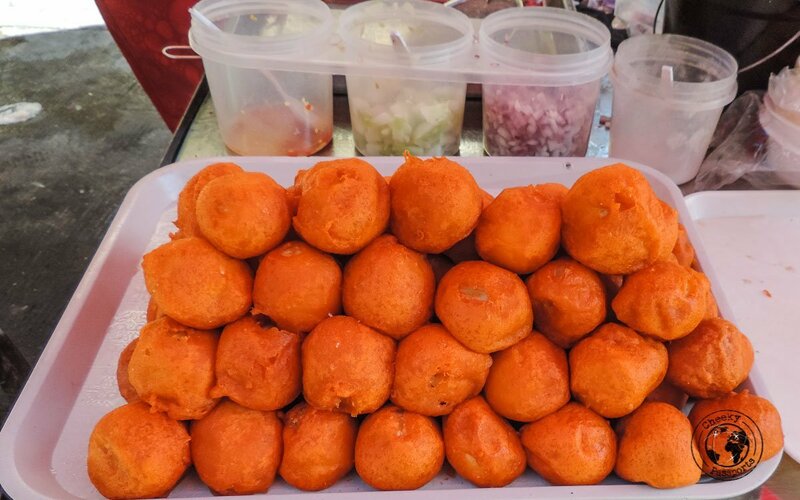 Fish balls are just that – deep fried balls of coarsely shredded fish. 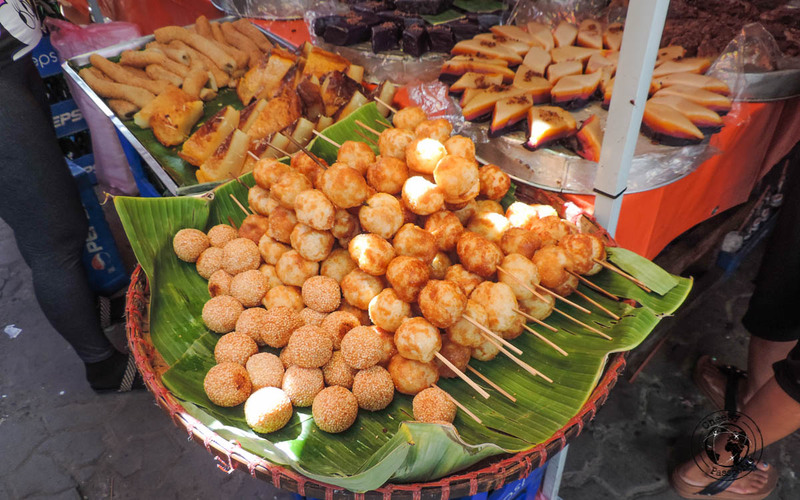 They are often served with a sweet and spicy sauce and are one of the most popular street foods in the Philippines. Hard-bolied quail eggs are deep fried in orange batter until crispy and served with a vinegar dipping sauce. Best to have them fried in your presence and to eat them immediately so as not to let them become soggy! 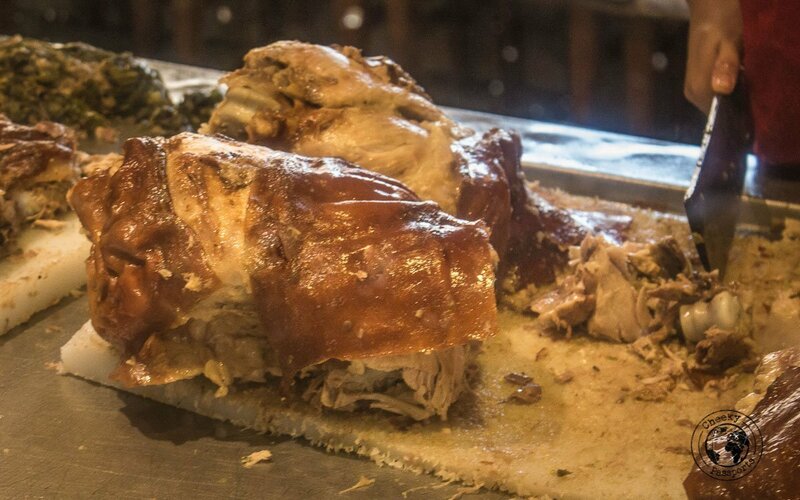 The king of Cebu food (and possibly of all the street foods in the Philippines), this mouth-watering tender, roasted suckling pig will guarantee that you keep going back for more and more. Gravy is normally served separately in a plastic bag but we never felt the need to use it. The mildly flavoured, slightly salted pork is the best we’ve ever had, and is a Filipino street food we would consider going back to the country for! We were not too impressed by suman which is basically sticky rice steamed in banana leaves or young palm leaves. We actually found it to be pretty bland and tasteless until we were told that it should be eaten sprinkled with sugar. Because anything tastes better with sugar right? It took us a long time to understand what the multi-coloured drinks in plastic barrels actually were. The iced drinks actually contain sago (tapioca pearls) and gelatin pieces and are usually flavored with syrup from a wide variety of fruit extracts. 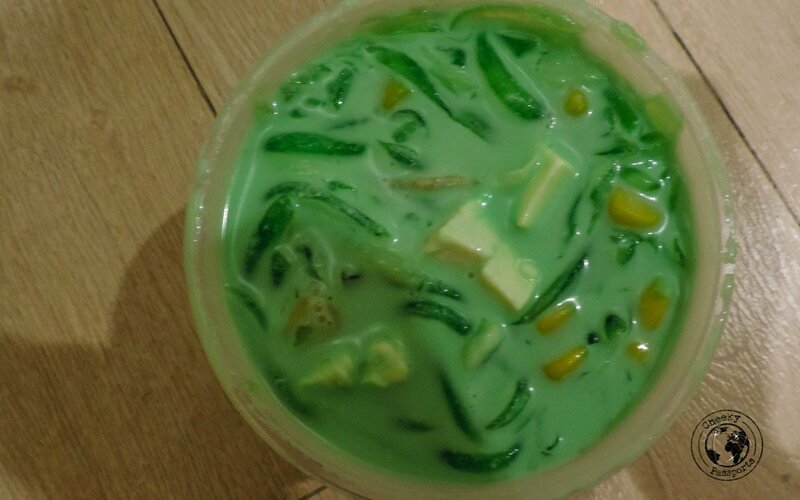 The one we tried was green and contained coconut pieces and sweet corn. These deep-fried caramelised banana & sweet potato goodies are worth all the calories packed in the little snack! 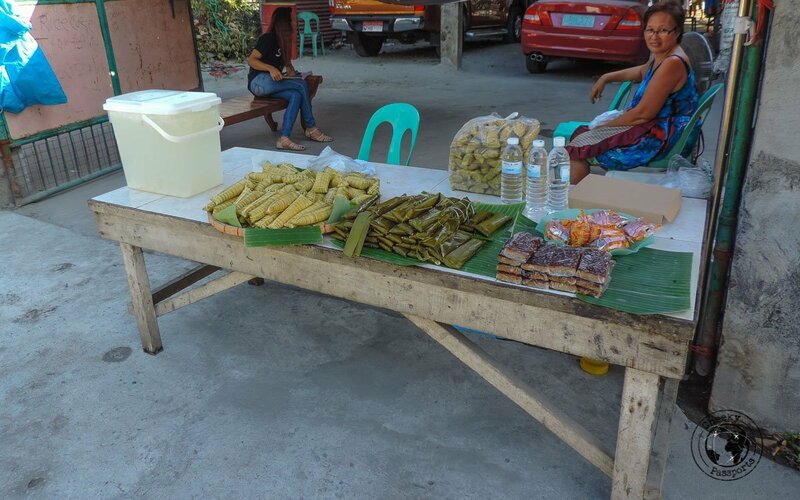 Available from hawkers in most villages, they are a very popular Filipino street food, best eaten when still piping hot and fresh. 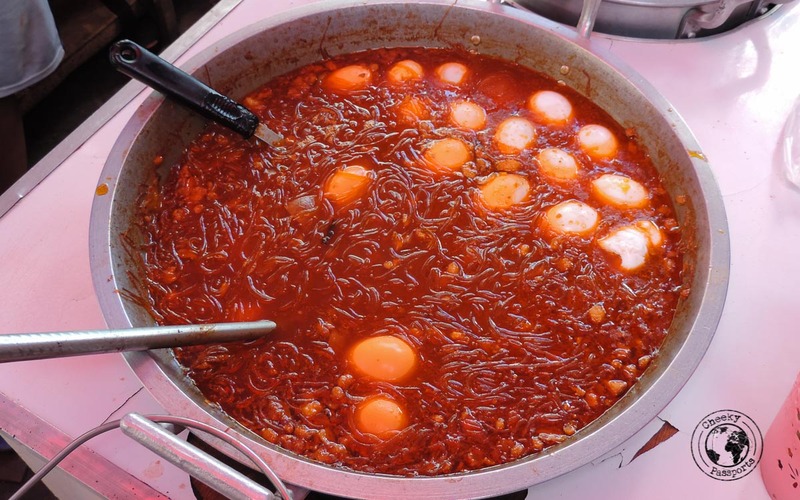 Sotanghon are actually cellophane noodles, but in Manila, it is also the name for a dish of a thick soup full of the same noodles and boiled eggs. Strong, hot and salty, it made for a great lunch and was one of our favourite street foods in the Philippines! 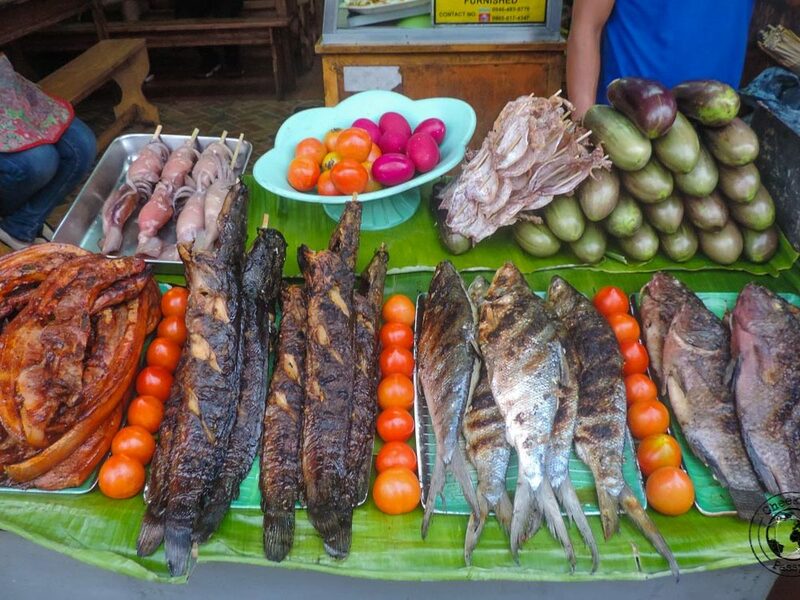 If you are still hungry, check out this list of Famous Filipino foods! Be sure to choose a stall or a hawker with a high turnover of ingredients. It is best to get your Filipino street food at the most popular stand, even if it might be subject to longer queues, and especially if it is packed with locals! Local people usually know who serves the best food, of course a high turnover means that there’s less chance of raw food being left standing for a long time. Do make sure that your food (especially meat) is thoroughly cooked. Deep-fried foods are the best choices since they are cooked at high temperatures. Try to avoid eating raw fruits and vegetables which cannot be peeled. If you must eat them, it is best to clean and prepare them yourself but do not use tap water!